PlaySugarHouse.com launched in New Jersey via a partnership with Golden Nugget. Owned by SugarHouse HSP Gaming, L.P. and named after SugarHouse Casino in Philadelphia, PA, this full service online gaming platform brings a robust online casino experience to the regulated New Jersey environment. SugarHouse does not offer an online poker room. Get your $250 deposit match bonus from SugarHouse today! Anyone 21+ can create an account on PlaySugarHouse.com, yet to play for real money, one must be physically located in New Jersey. Yes, that means that visitors of the brick and mortar SugarHouse casino, located on the Pennsylvania side of the Delaware River, are unable to concurrently enjoy real money gaming on the website and at the casino property. Not within the NJ border and want to hone those gaming skills without risking real money? Try SugarHouse4Fun.com to play for free from anywhere in the world. As for the real-money online casino, it operates under the Golden Nugget’s NJ internet gaming permit, and launched at a time where NJ online gambling revenues are experiencing impressive growth. Together with Golden Nugget Casino, and partnering site Betfair Casino, the Golden Nugget AC license accounts for roughly 35 percent of industry revenue as of September 2018. One of the newer faces in NJ's legal online casino market impresses with a strong software platform packed to the brim with top-tier content and loads of user-friendly features. Quality software paired with strong promotional and bonus offerings make SugarHouse a credible choice for any New Jersey online casino player. Getting started on PlaySugarHouse.com is quick and simple. Begin by creating a screen name that will identify you among the other big winners online. Enter an e-mail address, which will remain private, and continue. Already have a Rush Rewards or Casino4Fun account? Check the respective box for faster registration. First-time sign-ups will want to be aware of the many promotions, deposit bonuses, and rewards offered to customers. Immediately after signing up, users spin a virtual wheel where a smiling, inviting SugarHouse king awards new players with up to $20 bonus cash! The site offers many options when it comes to depositing for real money online play. Just like any online merchant, PlaySugarHouse.com accepts credit cards like Visa and Mastercard to load player accounts. Wire transfers, Neteller, ACH e-check (electronic check), and 7-Eleven’s Pay Near Me are all viable deposit methods. Cash deposits can be made at the Golden Nugget cage in AC. Unfortunately due to gaming regulations, the SugarHouse casino in Pennsylvania cannot support deposit or withdrawal transactions. SugarHouse also offers a prepaid card option, which is a strong alternative for players who have trouble depositing via ACH. There is certainly no shortage of rewards on PlaySugarHouse.com. The site shows its appreciation to its loyal customers, players of all styles and levels, as well as if not better than any regulated operator in the industry. The earning of points allows players to spin prize wheels. The rewards and bonus money earned from spins are dynamic based on one’s loyalty tier. A progress bar on the site allows players to track their progress through the loyalty tiers. Generally, players are interested in knowing that at Tier 7, they unlock a special VIP promotions calendar which informs them of perks and bonuses throughout the month for which Tier 7 and up account holders are entitled. Loyalty status resets monthly at the first of every month. The chart below indicates how many points are required to reach each tier level. Note that players who exceed twenty thousand points monthly may find themselves part of an untitled elite tier category. Just like at brick and mortar casinos around the world, the extended courtship of a very special few, the most select gamblers, is up to management discretion. In addition to wheel spins, Play SugarHouse has incorporated scratch cards into its VIP loyalty scheme. Now, players that reach loyalty tier 1 or higher by the end of the month will receive incremental scratch cards for added bonus opportunities throughout the following month. As an added perk, those who hit tier 10 will win scratch cards in the same month. How are points calculated for the SugarHouse VIP Program? Wager $5 in slots or video bingo to earn 1 point, $10 per point in roulette (and most other table games), and wager $25 to earn 1 point when playing blackjack or video poker. Rewards are random and range from $1 to a few hundred per level. I wasn't able to figure out a way to do an objective analysis. SugarHouse online casino offers around 275 slot titles, many of which are the Las Vegas classics slot players have come to love. In addition to Cash Spin and Wheel of Fortune, the online casino hosts classic table games at a variety of stakes. After signing up, it takes only a couple clicks for players to load real money Las Vegas or Atlantic City style blackjack or Let It Ride. Brick and mortar SugarHouse patrons might reasonably expect a blackjack wager minimum of ten or fifteen dollars per hand. Online however, there is always a seat, and at only ten cents per hand, all gambling budgets are welcome. PlaySugarHouse.com is home to some of the latest digital creations by major game developers like NYX and IGT. Experience four variations of roulette including a trending new favorite, 3 Wheel Roulette, which offers players three times the chance to win on every spin and as much as 1,200 times their wager ($0.30 min) through the Colour Up Bonus(™) feature. 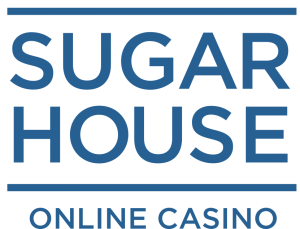 The SugarHouse Online Casino mobile app is available free to download in both the Apple App Store and Play Store. Whether using cell data (4G, LTE, etc) or connected to wifi, as long as the user is located in New Jersey, connecting to the one’s online casino account is as simple as opening the app. The mobile app, published by Rush Street Interactive, provides content in English, Spanish, and French. Even without logging in, players and prospective users alike have access to a searchable database of FAQs along with links to e-mail support and a live chat available every day from 9:30 a.m. to 3 a.m. The support database offers clear directions with images on how to solve many common questions like opting in or out of marketing communications or disabling proxy connections on iPhone or Android devices.